In more easygoing times, we adopted a “don’t ask, don’t tell” policy regarding the omnipresent fish sauce in Thai restaurants. Now that we are more rigorous in our avoidance of animal products—and consequently do ask—we’ve had the experience of Thai dishes stripped not only of fish sauce (and oyster sauce, too) but also of flavor. Thai Vegan on Main Street in Santa Monica brilliantly solves the flavor problem but is not an entirely nice place to eat (table cleanups are DIY, and the parking-lot bathroom is best reserved for emergencies). Satdha (2218 Lincoln Blvd.) offers an appealing alternative, a bright, clean space, with an all-vegan menu full of color, crispiness, creaminess, and punch—and it happens to be a walkable, though uphill, hike from Main Street. We loved both the yellow and green curries: the former with fried tofu, carrots, potatoes, and onions; the latter with chickpeas, baby bamboo shoots, eggplant, bell pepper, and green beans. We were also impressed by the “catfish” eggplant, battered with rice and wheat flour, fried, and soaked in a red curry paste—clearly a customer favorite. But we found ourselves scarfing with particular relish the vermicelli with curry sauce, a toss-your-own platter of rice noodles, beans sprouts, chopped green beans, and pickled mustard greens. 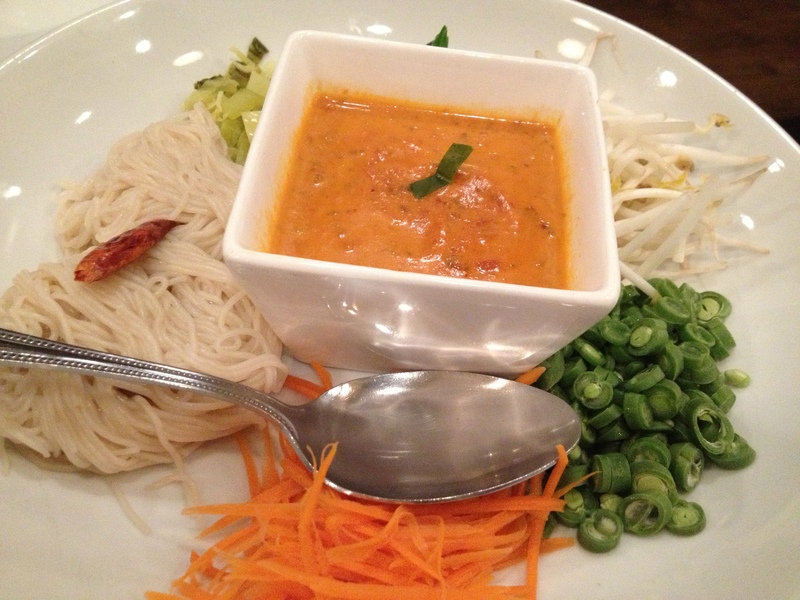 After three visits, we can now recommend Satdha without reservation. Will we be going back again soon? You hardly need to ask. In L.A., the heat wave’s over, and we’re back to the traditional coolness of May Gray / June Gloom, not a bad time for some soup. Fortunately, it’s easy to make just about any kind of vegetable or bean soup you like. Start here, and soon you’ll be cooking up your very own creations. At medium heat, sauté onion in olive oil for a couple of minutes until tender. Add vegetable (two thinly sliced carrots or some chopped Napa cabbage, for example) and sauté till tender. For carrot or cabbage soup, add ½ t cumin, bouillon cube, salt, and pepper. Add water and bring to boil. For creamy soup, process for 1 minute in Vitamix. For chunkier soup, use an immersion blender. For potato soup, chop a medium Yukon potato and boil it in salted water for 10 minutes. Add it to the onions with the bouillon cube, water, salt, and pepper. Process as indicated above. At medium heat, sauté onion in olive oil for a couple of minutes until tender. Add beans, bouillon cube, salt, and pepper. Add water and bring to boil. 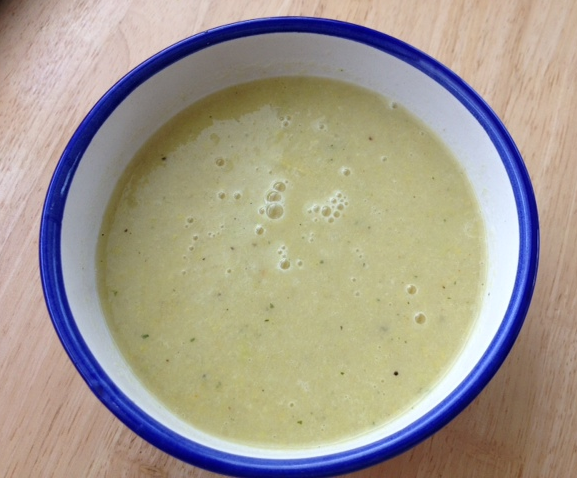 For creamy soup, process for 1 minute in Vitamix. For chunkier soup, use the immersion blender. This basic recipe works well with black beans or lentils. For black beans, add ½ t cumin to the sautéed onions before adding beans. For lentils, you can sauté fresh chopped spinach with the onions or just add a pinch of fresh rosemary. This recipe largely follows the one for vegan meatballs. 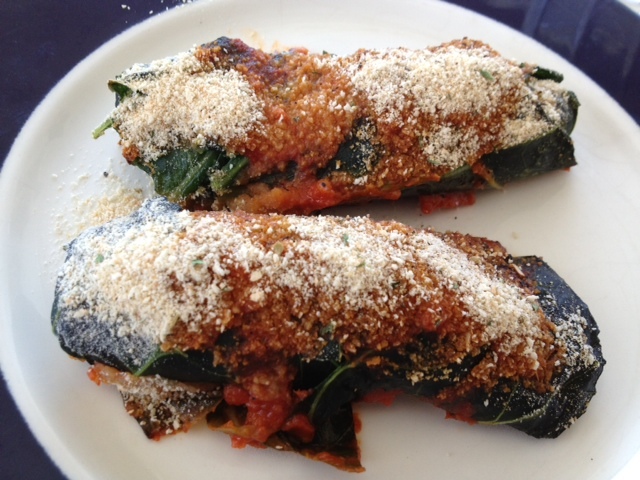 The proposed name of collardoni (a play on cannelloni, which these stuffed leaves somewhat resemble) was set aside, but call them what you like! Preheat oven to 350. Remove stems from collard greens, boil for 3 minutes, then rinse with cold water. Meanwhile, sauté onion in olive oil for about 3 minutes. Add Field Roast and sauté for additional 3 minutes. In medium bowl, combine cooked mixture with half the bread crumbs, parsley, flaxseed “egg,” and salt and pepper to taste. (For “egg,” blend 2 T flaxseeds and 1/2 cup water in Vitamix. Refrigerate leftover for another occasion.) 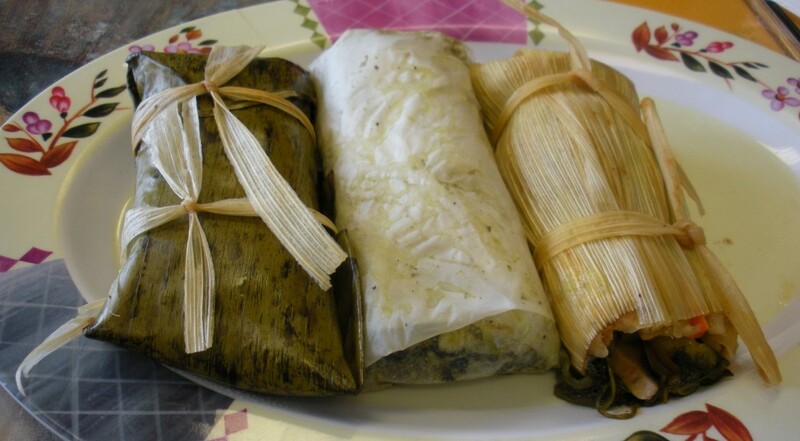 Distribute mixture to 4 leaves and roll them up, burrito-style. Layer a casserole dish with tomato sauce, add stuffed leaves, and top with additional sauce, remaining bread crumbs, and more pepper. Bake for about 40 minutes. 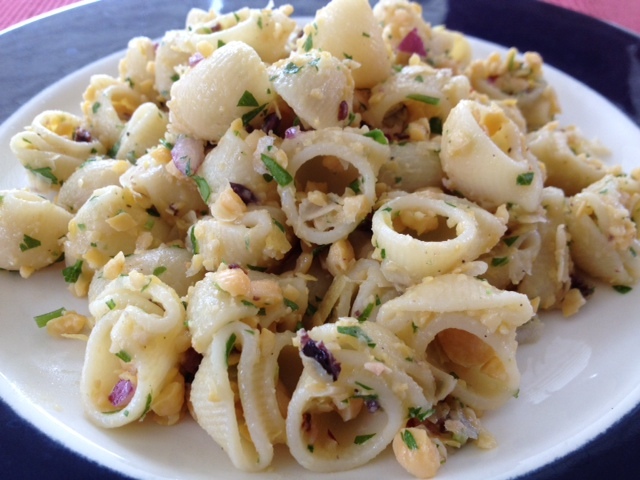 This is another development of the basic recipe that yielded macaroni and chickpeas. It’s a combination of flavors drawn from the same Mediterranean palate. While pasta cooks, mash chickpeas. Add olives, sundried tomatoes, parsley, and lemon zest and toss with lemon juice and olive oil. Toss in pasta, and add salt and pepper to taste. 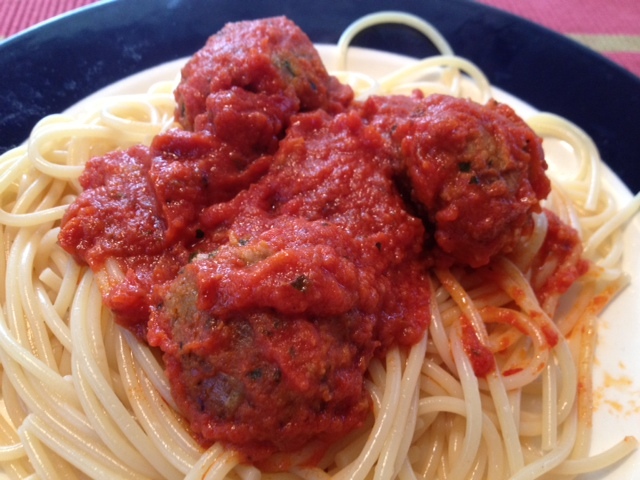 Unsatisfied with the available vegan meatball options (all frozen), we tried making our own. This recipe uses Field Roast links as the protein basis, with flaxseeds as the binder. The resulting “wheatballs” were tasty and not too much trouble to prepare. Sauté onion in 1 T olive oil for about 3 minutes. Add Field Roast and sauté for additional 3 minutes. In medium bowl, combine cooked mixture with bread crumbs, parsley, flaxseed “egg,” and pepper to taste. 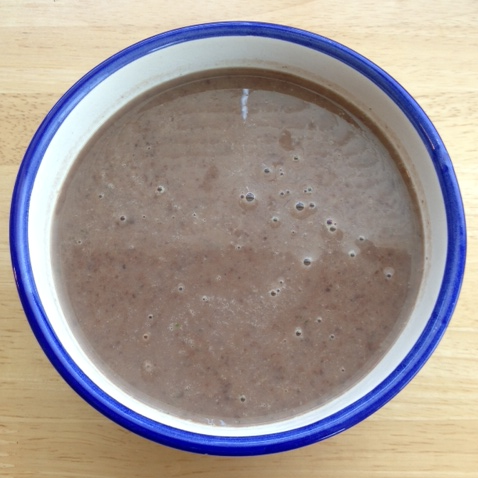 (For “egg,” blend 2 T flaxseeds and 1/2 cup water in Vitamix. Refrigerate leftover for another occasion.) Form mixture into balls, about 1 T each. 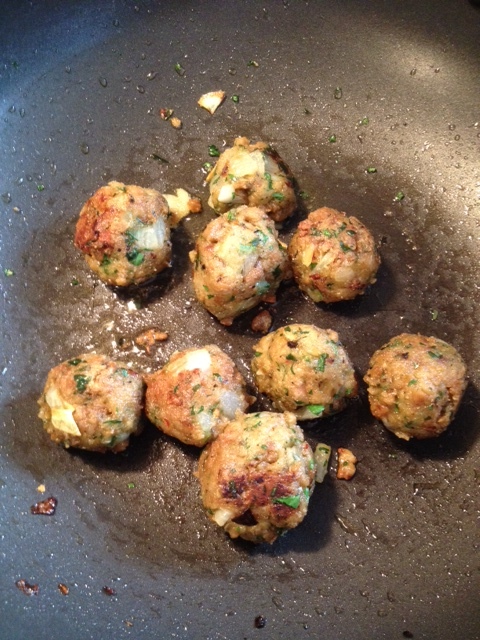 Sauté meatballs in nonstick pan with 1 T olive oil until browned. Simmer in tomato sauce for about 10 minutes (while pasta cooks). (For a pre-made sauce, we recommend Rao’s Marinara.) Top spaghetti with meatballs and a small amount of sauce. This easy soup is healthy, hearty, and very low in calories. Your nutritionist will cheer, and so will you. Chop onion and sauté in olive oil at medium-high heat for about 5 minutes in large pot. Meanwhile, remove stems from kale, chop it, and add it to onions, sautéeing for another few minutes until limp. Add oregano, pepper, pinch of salt, stock, and beans, and bring to boil. 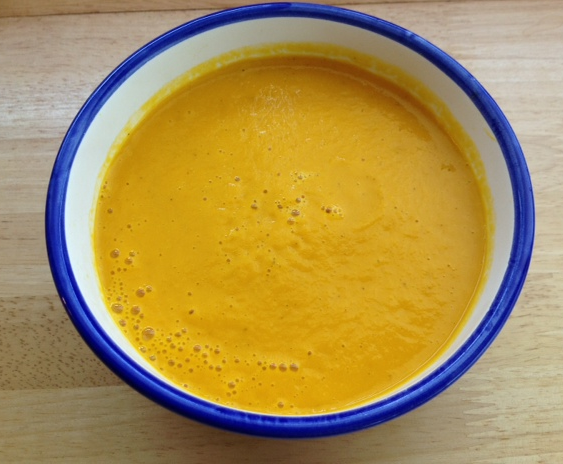 Reduce to simmer, and partially blend with immersion blender (or remove and process a cup or two of soup in a blender before returning to pot). 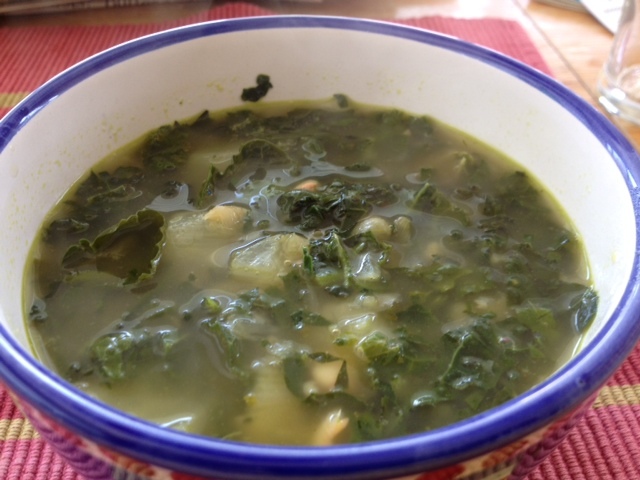 The final product should be broth-y but chunky, with lots of floating kale and whole beans. 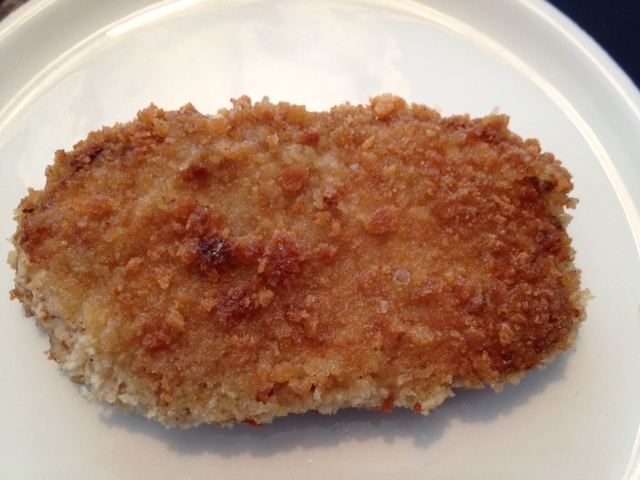 Inspired by the Milanese at Tal Ronnen’s Crossroads Kitchen in Beverly Grove, we attempted our own breaded Gardein cutlet. The challenge was twofold: (1) make the bread crumbs stick to the patty and (2) prevent them from sticking to the pan. We accomplished this with batter made from macadamia nuts and flaxseeds, and the standard combination of lots of oil and a hot pan sprinkled with coarse salt. The result was satisfyingly crispy on the outside and, somehow, juicy on the inside. 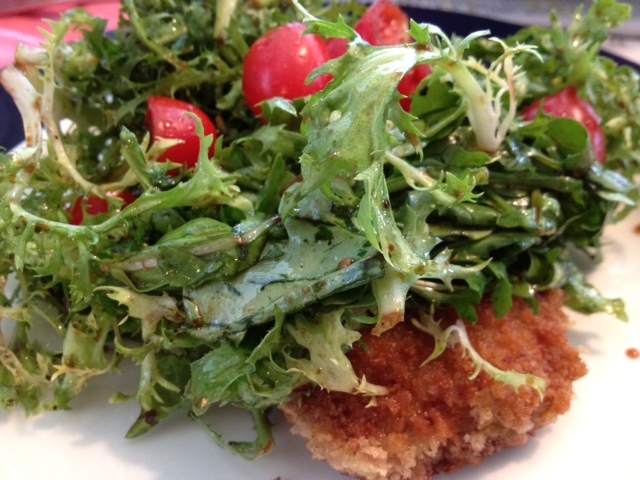 Topped with a salad of arugula, frisée, and cherry tomatoes tossed in a balsamic vinaigrette, these cutlets were a filling but not-too-heavy treat. Combine macadamia nuts, flaxseeds, and 1/2 cup of water in Vitamix at top speed until thoroughly blended. Dredge frozen patties in batter, then coat with panko, pressing each patty down in the dish to crush large crumbs into flour-y powder. Fry at medium-high heat for 4 minutes on each side. Let sit on paper towels for a minute or two to remove excess oil. Plate, and top with salad.